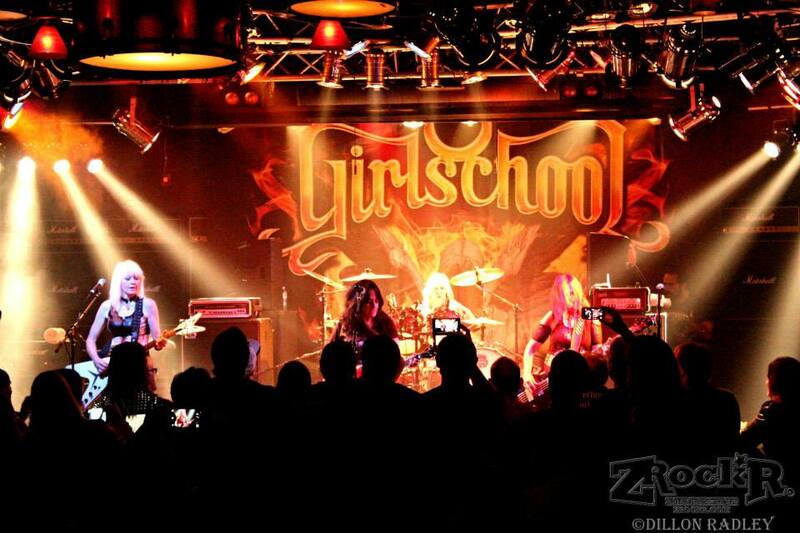 Home›Reviews›Girlschool - New Wave of British Heavy Metal Greats Rock Vegas! 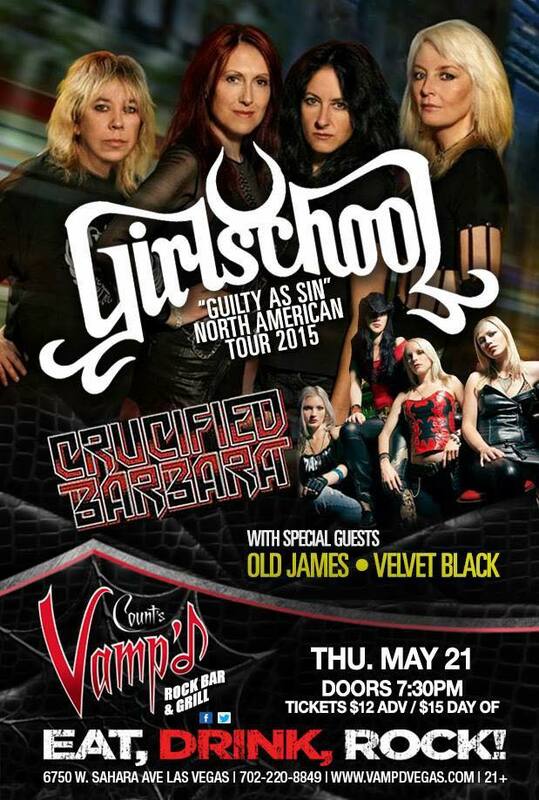 Girlschool played Vamp'd on Thursday, March 21, 2015. 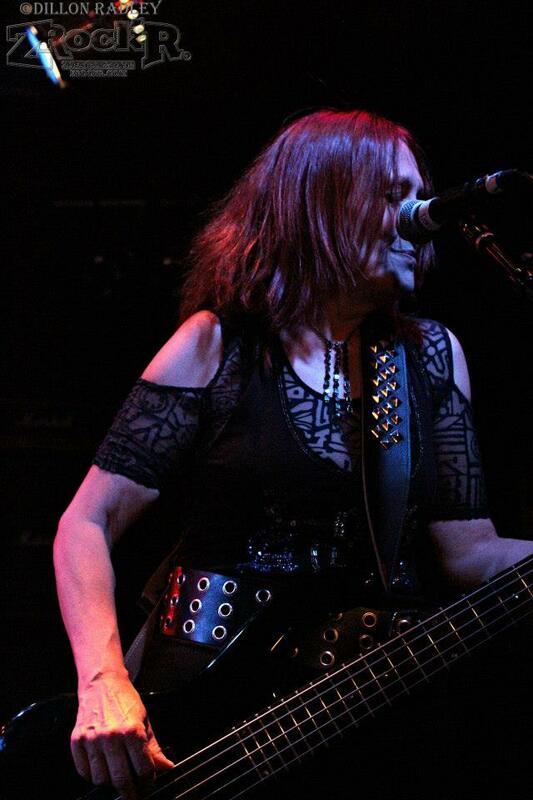 I was very much looking forward to seeing Girlschool for the first time. Usually, I tend to skip opening acts unknown to me these days if the headliner is playing Vamp'd. I'm glad that I didn't this time as all three openers were very good, to varying degrees. First up was a three-piece act from Quebec called Velvet Black. 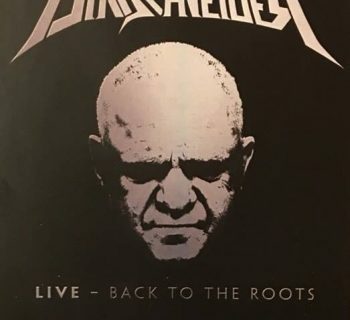 They played a handful of groovin', bluesy, heavy and straight-ahead songs on which the bassist handled the lead vocals, and at times reminded me of Derek Davis (Babylon A.D.). Nice way to start the festivities. 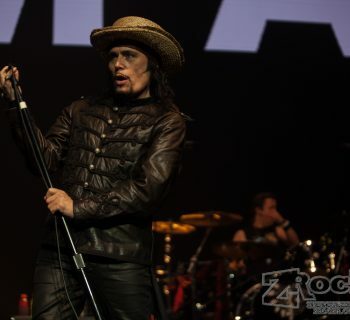 Next up was Old James, yet another act hailing from the same city in the Great White North. 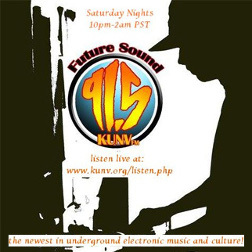 Getting the growing audience's attention with a teaser intro of Rush's legendary instrumental "YYZ," they certainly got mine, as they proved that they weren't slouches on their instruments in the least. This was a great gimmick to have the crowd's attention from the get-go as to what their originals would sound like. As they plowed through one song after another, their formidable lead singer reminded me of Sebastian Bach in the upper register but with a Southern rock style. He also tackled the second six string on some songs, not letting his twice-failing guitar strap get in the way. They seemed to win the crowd over as they had their first time here this year; the band had opened for Uli Jon Roth at Vamp'd back in January. The ending of their opening song closed out the set in fine fashion. Crucified Barbara. Their huge banner should've been the first clue that these four young ladies were about to leave an impression. An indelible sonic one seared into the recesses of your brain. From the opening salvo of their first number to their final tune of the night, I'm fairly certain that most patrons were concerned about how the headliner would follow this rather polished Swedish metal juggernaut. They've been around in one lineup or another since 1998, and it shows. Taking no prisoners and adding new fans live on a nightly basis with their conviction, stellar lead vocals, instrumental prowess, and catchy songs dripping with a fresh yet classic metal edge, this a band to watch, as they proudly carry the torch for the genre spearheaded by bands such as Priest and Maiden. They have four full length LPs which should be picked up ASAP. 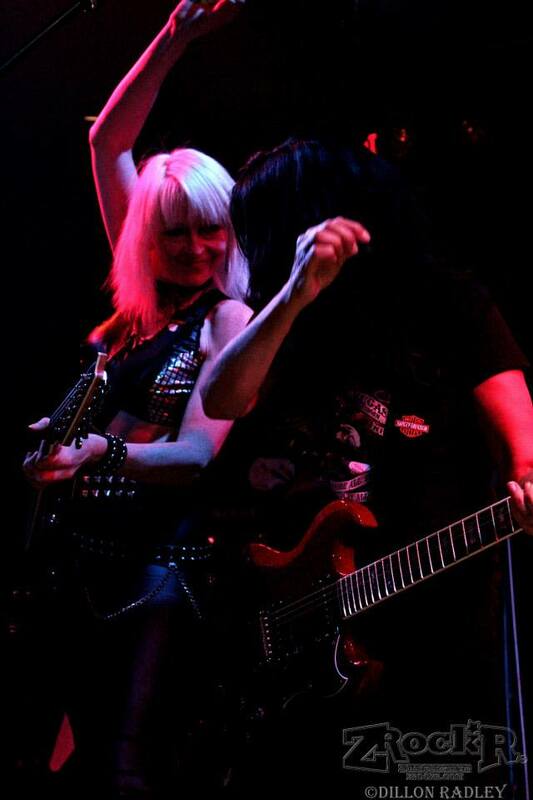 Girlschool vocalist Kim McAuliffe and lead guitarist Jackie "Jax" Chambers. 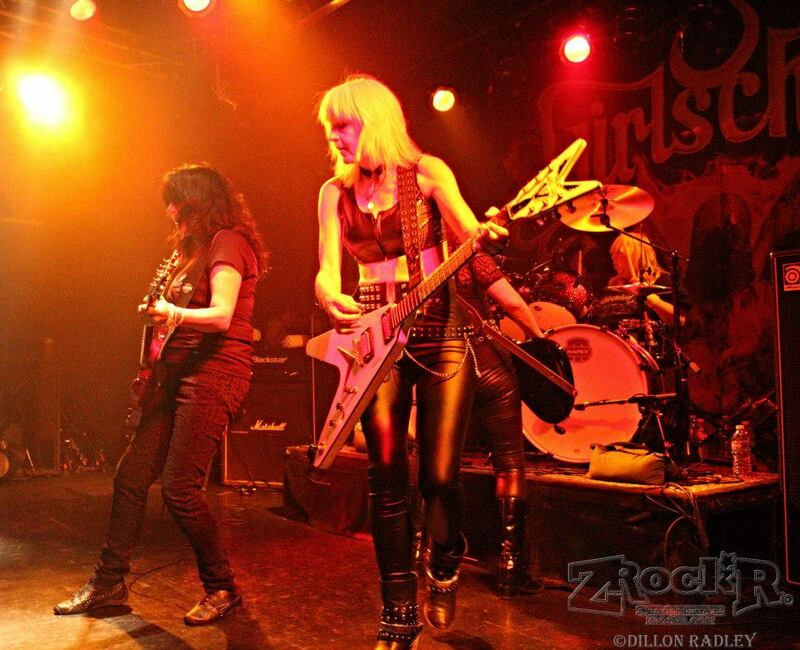 Girlschool. One of the bands whose first videos I saw the first few hours I became entranced by the then-new and groundbreaking MTV. For some reason, I never did catch them anywhere in Detroit on their early tours. Bummer. Anyway, I understand, this was their first tour in 25 years on the other side of the pond. The second date of their "Guilty As Sin" tour, Vamp'd was primed for a lethal dose of the ladies who were an integral part of the NWOBHM. From the get-go, hitting the faithful with "Demolition Boys," they plowed through 15 songs in fine form. 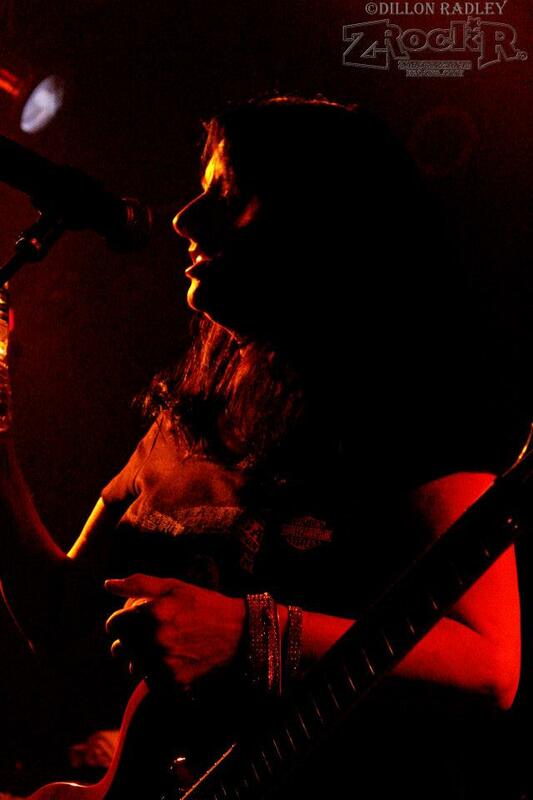 Although former lead guitarist Kelly Johnson (2007 R.I.P.) was missed, the rest of the original lineup was rounded out by a more than competent Jackie Chambers. Peppering their hard-hitting set of classics with a few new numbers, Motorhead's old compatriots showed us that time hasn't mellowed their approach. "The Hunter," "Screaming Blue Murder," "Hit and Run," and "Race With the Devil" were all represented with a vengeance. "Tush", their take on ZZ Top's chestnut, would've been nice to hear, but it's always wise to leave 'em wanting more. All in all, this fan from way back was impressed. 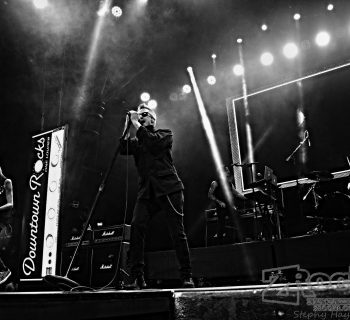 Editor's Note: The ZRock'R Magazine LIVE! " Metal Grrrl Power" show on lvrocks.com with in studio guests Kim McAuliffe of Girlschool and Mia and Nicki from Crucified Barbara - along with a lot of great music from the women who rock you- will be available as a podcast HERE ( http://www.lvrocksradio.com/category/more-talk-music-shows/zrockr-live/ ) Just look for the 05/21/2015 show!